The reader who trudges through the sluggish beginning of this book should keep in mind that it’s a true story written by two real people, and not the fictitious fodder of a psych-thriller novelist.There’s a payoff at the finish line, and along the way unfolds an unbelievable tale of injustice, faith, forgiveness and, ultimately, friendship. 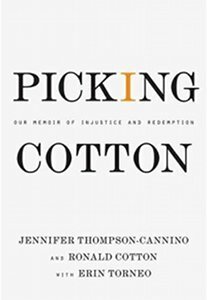 Picking Cotton is a rare, pure story about power and powerlessness, and the fallibility of the human mind. Most of all, it’s a story of the transcendent possibilities of the human spirit.